The Grange is a grade I listed building designed by Augustus Pugin built between 1843 & 1844. It is an important building in Ramsgate, as it is the house that he built for himself & his family to live in. He was a devout catholic man & wanted to bring Catholicism back east Kent & so a church & monastery were also part of his plan. Pugin spearheaded & drove the early – mid Victorian phase of the Gothic Revival, he built many churches, schools, convents, monasteries & country houses & also designed the interiors for the Houses of Parliament. The Grange was built according to Pugin’s own criteria, he insisted on ‘No features … which are not necessary for convenience, construction or propriety.’ Although the interiors were very rich & striking the house itself was not particularly extravagant, built with yellow stock brick & surrounding walls of flint. The internal function was the starting point for Pugin’s design on this build – Windows, roofs & chimneys were placed to work with life inside the building as opposed to the external appearance. Pugin’s principle was that form should follow function. In 1852 Pugin died at the young age of 40. 9 year later Augustus’s eldest son Edward returned to live in the house in with his stepmother & other family members. Edward who was also an architect made various changes to the house. The house remained in family ownership until the death of Augustus’s last son Cuthbert in 1928, after which it became a school run by the monks of St Augustine’s monastery. It then passed into private ownership in the early 1990s, & sadly continued to deteriorate until it was put on the market again with talk of turning it into flats. In 1997 the grange was rescued from development by the Landmark Trust & with a grant from the Heritage Lottery Fund. The HLF provided a further grant for its repair & restoration (2004-6), with generous additional support from English Heritage, Thanet District Council, charitable trusts & many private individuals. 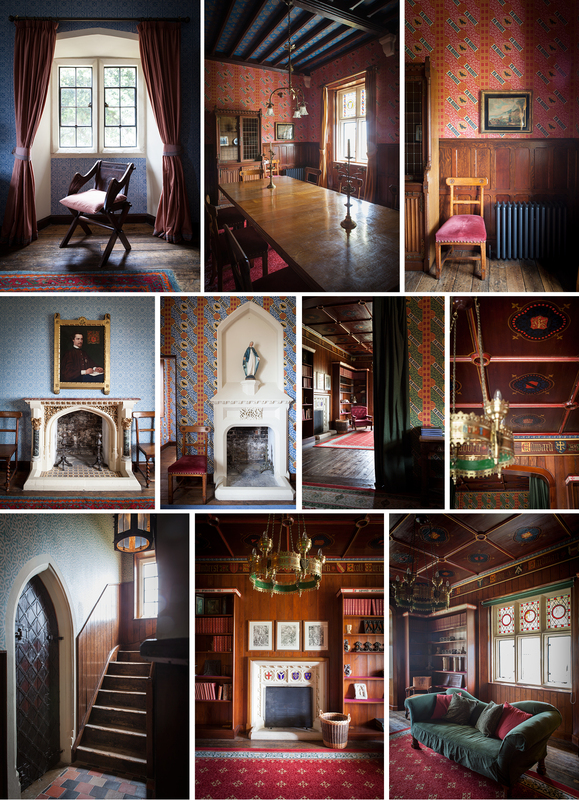 The Landmark Trust carried out detailed research, which enabled them to return the house to Pugin’s time in the 1840’s. Pugin left a lot of documentary evidence & traces of it’s original decoration & other clues were concealed within the fabric of the building. Pugin designed his own wallpaper ‘En Avant’ which can now be seen in various colour ways around the house. Fireplaces, ceiling decorations, doorway arches have been restored & returned to their original design. In Pugin’s rather masculine library matchboarded paneling has been replaced & enameled shields, once lost, are now replaced with replicas of the originals. Text friezes of quotations from the Old Testament book of proverbs have been reinstated & run around the top of the large bookshelves. 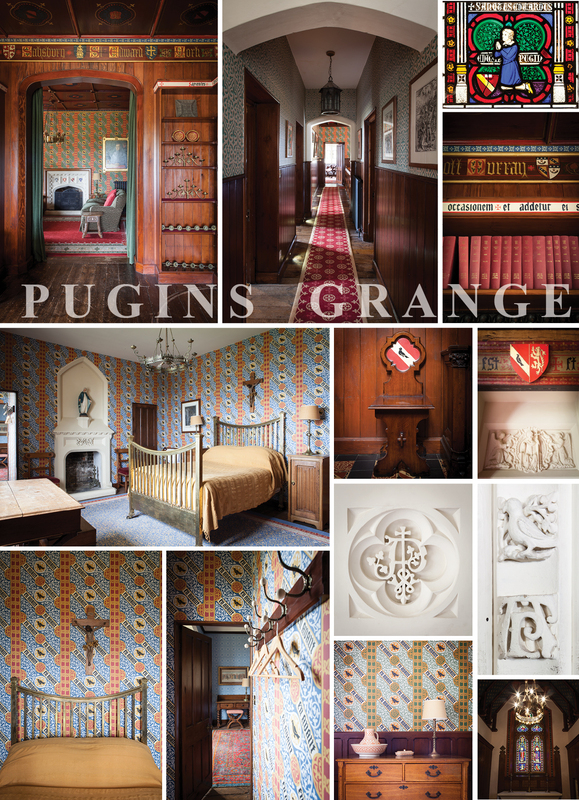 The Grange has been sensitively restored to take us back to Augustus Pugin’s time in the house. The landmark trust’s work is vital – these buildings are restored to be living, working buildings – not museums, although they continue to educate us. They are given new life, so that they can be used, lived in and enjoyed by all now & for the future. VISIT THE GRANGE: The Grange (St Augustines Rd, Ramsgate) is open every Wednesday afternoon throughout the year for pre-booked tours of the ground floor rooms. To book tel: 01843 596401 between 9 & 11am. This is a great post with awesome pictures!